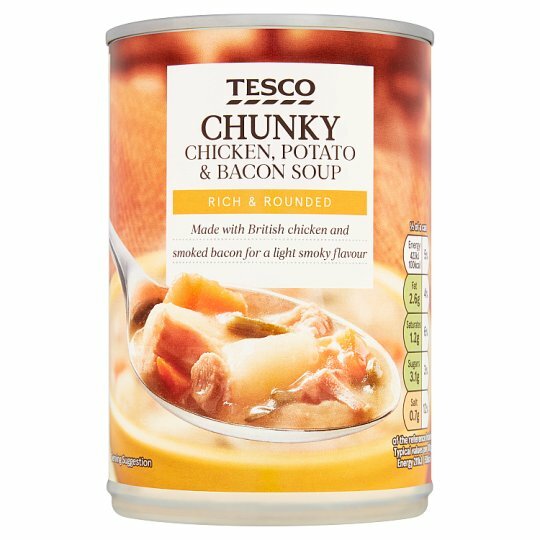 Chicken, potato & bacon soup. Water, Chicken (11%), Carrot, Potato (8%), Wheat Flour [Wheat Flour, Calcium Carbonate, Iron, Niacin, Thiamin], Double Cream (Milk), Modified Maize Starch, Bacon (1.5%) [Pork, Pork Fat, Water, Salt, Preservative (Sodium Nitrite)], Cabbage, Yellow Pea Flour, Salt, Yeast Extract, Garlic Purée, Onion Powder, Leek, Garlic Powder, Black Pepper, Sugar, Leek Powder, Flavourings, Colour (Carotenes). Store in a cool, dry place., Once opened transfer unused contents into a non-metallic container, cover and refrigerate., Consume within 2 days. Empty contents into a non-metallic bowl and cover. Heat on full power for 2 minutes (800W/900W). Stir, then heat on full power for another 1 minute 30 seconds (800W), 1 minute (900W). Heat gently for 3-4 minutes, stirring frequently.